Finestra offers a choice of grilled Portobello and buffalo mozzarella salad with smoked ricotta and cherry tomatoes or Pan-seared goose liver with caramelized apples and Eggplant puree for appetizers; Brick Oven Branzino, Black Truffle Cream Sauce, Asparagus and Herb Salad. And for the main course a choice of Lamb Three ways: Olive crusted lamb rack, braised shank, lamb loin alla Romana and eggplant Caponata; Risotto of fresh peas topped with grilled prime beef fillet and pancetta crisp or Spaghettini with little neck clams, garlic, San Marzano tomatoes and sea urchin in white wine sauce. And to satisfy your sweet cravings, you have a choice of Red berries with Limon cello merengue or Chocolate ‘Perugina Gianduia’ tart. This set menu is priced at Php2,000* per person. At Strip, Chef Trevor Macleod has created a lavish four-course set dinner comprised of Mushroom Soup with Truffle oil & chives; Tuna Tartar with quail eggs, rocket greens, ginger carrot emulsion; for the entrée a choice of Angus Beef Tenderloin with onion puree, glazed vegetables, crisp potato press or Roasted Lamb Loin vegetable ratatouille, chick pea fries, smoked tomato jam or Grilled Salmon Orzo Pasta, green pea, bacon powder and for dessert Manjari Chocolate Passion Fruit Silk with Raspberry Sorbet, available at Php3,200* per person. Yakumi offers a set-menu at Php3,000* per person. The menu consist of Hamachi, tuna, salmon sashimi and three types of sushi or Beef Tataki: Seared beef strip loin with onion soy dressing and beef sushi to start. Followed with ‘Akadashi’ Manila clam red miso soup. The main dishes are a choice of Golden lobster tempura or Grilled Striploin with vegetables or Lamb Saikyoyaki: Miso marinated Australian lamb chops with Kinome and steamed rice. Mikan crème brulee and Wasabi Sorbet is a unique dessert to top your meal. 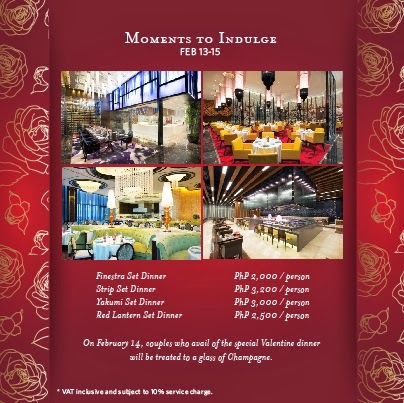 Red Lantern highlights the flavorful Suckling pig and smoked duck breast; Pumpkin and corn soup with seafood; Pan fried beef tenderloin and prawn with pepper corn sauce; Steamed egg white scallops; Baked sea bass with sweet soy sauce; Deep-Fried Boneless Chicken With Almond Flakes and a Valentines cake or Chilled sweet pears with white fungus priced at Php2,500*. 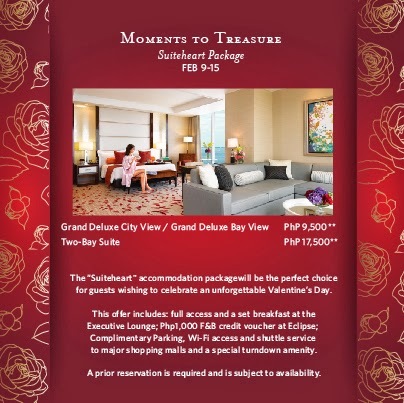 On February 14, couples who avail of the special Valentine' dinner will be treated to a glass of Champagne. *** Applicable for Local residents and expats with ACR. Rates are subject to 10% service charge and 12% VAT. * VAT inclusive and subject to 10% service charge.